Being an adult is boring. It's a long checklist of necessary acts of maintenance that, in the end, fail us. That's why we rely on fun-enhancing phenomena like color runs and adult kickball leagues—and gadgets like Oral-B's new Bluetooth-enabled toothbrushes and app, which are designed to make one of life's most mundane tasks seem like fun. At first glance, it sounds like a punchline to a New Yorker cartoon about the wiles of modern technology. After all, who needs an app to tell them how to scrape their teeth down every morning? But after I had my first cavity last month, I was ready to try anything that could right the wrong creeping from molar to molar inside my mouth. Oral-B's SmartSeries 7000 is a Bluetooth 4.0-enabled toothbrush that connects to a free app that tracks how often you're brushing, whether you're doing it right, and for how long. It will retail for $220 when it's available in the US in January (it's already on sale in the UK). A cheaper version, the SmartSeries 5000, will retail for $160 when it arrives this fall. For all that money you get the following bells and whistles: The SmartSeries counts to 120 seconds for you, vibrates when you're pushing too hard, records your daily "times," and tries to entertain you with tips and news headlines while you brush. One of the headlines was about prostitutes. In the most basic sense, it matters because keeping your teeth clean matters. Going to the dentist is scary and terrible enough when it's for routine maintenance. Cavities and root canals are another level of (potentially avoidable) nightmare. But more specifically, given the fact that internet connectivity has wormed its way into everything from your dog's fitness level to the very cup you're swilling your morning beer from, a connected toothbrush seems inevitable. The fact that we're all still scraping at our gums with bits of $2 molded plastic seems hopelessly old-fashioned. What are we, indentured servants? With this new-fangled device, Oral-B is banking on the popularity "quantified self" movement, in which consumers track every aspect of their lives and record them in minute detail for later meditation. The whole point is to make the utterly mundane task of going about adulthood a little less boring. Even oral hygiene, a task most of us feel nothing but an ever-so-slight dread about. The app is, surprisingly enough, a joy to use: It's pretty, well-designed, and against all odds, pretty damn fun to use. But what about the toothbrush itself? It feels slightly clunky compared to the sweet Sonicare toothbrush I was given as a gift (a hint?) by my parents years ago; its motor is quite loud, and its body is a little larger than you'd expect. It has six cleaning modes, which you adjust with a button on the body, and arrives with a nice-looking case and small recharging port. If you don't mind the bulk, this is a brush you won't be ashamed to have in your bathroom (unless you mind people asking why the hell your toothbrush is Bluetooth-enabled, as many guests have asked me over the past few weeks). There's a band of plastic-covered LEDs at the oscillating head, which flash red when you're pushing on your teeth too hard thanks to a pressure monitor; when you're brushing, the red glow is clearly visible just in front of your face. Other than that, it's pretty standard as far as mid-2010s design goes: Sinuous curves and plenty of white plastic. The point of this product is to trick you into taking better care of yourself. As someone who's managed to outsmart (or at least outlazy) a whole host of other life-improving gadgets, I was not hopeful. But the app is actually a case study in how to leverage user experience design to get people to do things they don't enjoy. To do so, it uses a classic good dentist/bad dentist strategy, starting with positive reinforcement—good job messages, cool graphics showing your progress—followed up with negative warning signs—a red flashing light when you're pushing too hard, or an iOS notification that you haven't used your toothbrush for a while. But when all else fails, which it inevitably does because humans are lazy, the app uses the oldest trick in the book: Distraction. As you brush, it pulls up headlines. I read an update to Google news as I focused on my lower right quadrant. Another day, it showed me some pictures of lion cubs. Needless to say, I kept brushing. Then it told me some things about how coffee is turning my teeth yellow. When I finished, a little emoticon popped up: Bravo. Yet humans are pretty good at evading unpleasant or boring tasks. By the end of the first week, I wasn't really looking at the app when I brushed. Soon I wasn't even remembering to bring my phone into the bathroom so the toothbrush would link up to record my brushing. Despite my misgivings, the app is actually the highlight: And luckily, anyone can download it for free and use it manually with their own toothbrush. It's well-designed and actually quite fun to use, if a bit of overkill for anyone not interesting in tracking the minutia of their own lives. It also bears mentioning that setup was dead simple, which is important given the fact that this would make a great gift for a kid or an older adult who might not be well-versed on setting up Bluetooth-enabled gadgets. The same goes for usability within the app itself. 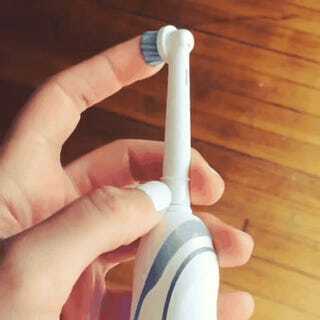 Oddly enough, the smartest thing about this toothbrush is the UX design, not the actual product design. Other companies looking to develop their own mobile applications would do well to study this one. One concern, for me, is that the brush wouldn't record my activity unless I had my device nearby when I was brushing. Now, sure, that might not seem like a huge deal. After all, who doesn't have their phone nearby these days, even in the bathroom (especially in the bathroom)? For starters, tired people. Drunk people. Forgetful people. People who just want to scrub the bare minimum of gunk off their teeth and get to sleep. In theory, the SmartSeries is designed to store information on your last 20 sessions so that when you do connect with the app, your history is synced. I had trouble getting this functionality to work, and it turned out I was doing it wrong: You need to go to the main screen and then hit the "mode" button to initiate the sync. It's not exactly intuitive, but it works. The brush itself is fine, though I did notice an ever-so-slight aftertaste that filters through—presumably from the motor—at times. It doesn't make brushing unpleasant, but it's worth noting given the price of this thing. Do you need a $220 toothbrush that tracks your every move and analyzes your technique? No. Do you want one? Judging from the straw poll I very scientifically carried out over the past two weeks, a surprising number of people do. And given that you're spending the money on improving a part of your body you rely on to survive, some may find it easy to rationalize as a purchase. The Oral-B Bluetooth brush does exactly what it says it does. It will get you thinking about your routine more than you normally do. The question is how much you're willing to spend to gameify even the most banal aspects of life as an adult human in 2014, right down to taking care of your chompers.